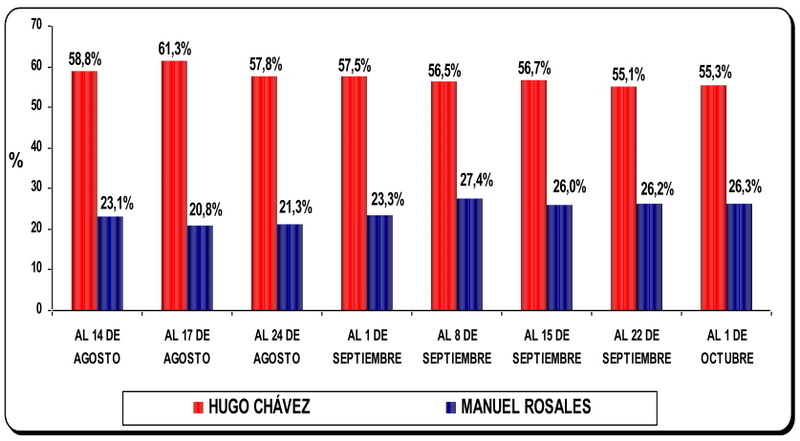 All the recent polls are roughly right, and Chavez is beating Rosales by somewhere between 15 and 30 points. People are too scared to tell pollsters the truth, and the race is actually neck and neck. Which one is it? 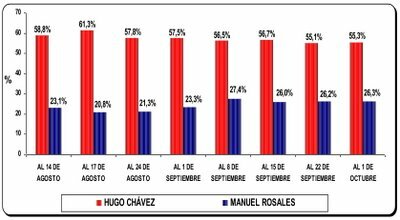 Frankly, the polling news is so incredibly awful, I can see how it beggars’ opposition supporters’ belief: if DATOS, Consultores 21 and Zogby are more or less right, it would mean that, through mid-October, Rosales had managed to consolidate the anti-Chavez base and that’s it. His numbers are below even the what a “generic anti-Chavez candidate” had in May and June polling. That would mean Rosales has not even managed to consolidate the support of all the non-Chavistas who said they were willing to vote against Chavez six months ago. Now, a bunch of them are “undecided”! Not good news for a candidate whose only path to victory, demographically speaking, is to sweep essentially all undecideds and win a few soft-core chavistas as well. Every day, surveys are conducted in nations where voters face substantially more danger or political repression than they do in Venezuela. Whether it’s the Gaza Strip or West Africa or Nepal — polling is happening. Pollsters who work in such places have developed methods for determining whether/how fear affects their ability to take an accurate survey, and for making the necessary adjustments. But ask Luis Vicente Leon, Luis Christiansen, Saade, Keller et al if they’re finding it harder than usual to get people to agree to participate? Once they agree, are more interviews (than usual) terminated once people realize political questions are included? They’d tell you: nope, nothing out of the ordinary on that front. Nor would any other of the normal indicators be present — or, again, not present in sufficient size to warrant throwing traditional methods (and their results) out of the window. But even if the slew of recent polls are all way off because people are fibbing to pollsters, I don’t really see how that’s good news for the opposition. If folks really are so scared of getting on the wrong side of the Bolivarianos that they won’t even talk honestly to a pollster, what are the chances they’ll feel emboldened enough to put their finger on a fingerprint scanner, get their names ticked off on a cuaderno electronico, and then go cast a vote for Rosales on a Smartmatic machine? That, my friends, is a much, much scarier proposition. We should be honest here: unless something dramatic happens in the next month and a half to change the dynamics of the race, we’re going to lose, and we’re going to lose by a lot. Admittedly, it always seemed likely that we would lose simply because most people vote with their pocketbooks and we’re in the middle of an extravagant oil bonanza. But losing by 5 points is not the same thing as losing by 25 points…and what’s staggering is that we seem headed for 25-point country. A more eloquent candidate, one less visibly tied to the traditional opposition political class, a more effectively communicated Mi Negra…we can all start making our little pet lists of what the opposition might have done differently. But then, even the perfect oppo candidate running the perfect oppo campaign would find it hard to beat Comandante Moneybags and the $60/Barrel Brigade.